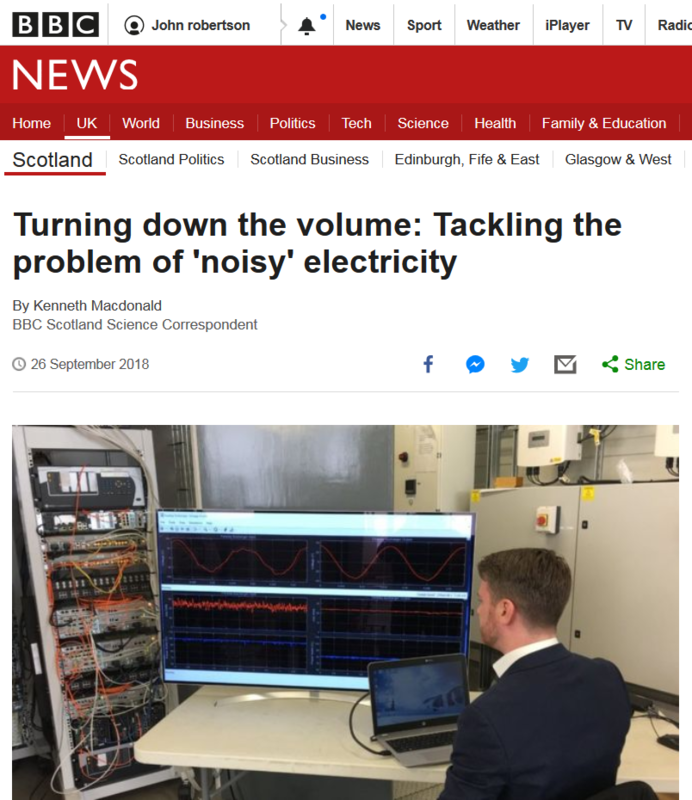 On a topic too ‘hard’ for this ‘soft’ social scientist, reader Wiiliam Henderson, offers this riposte to BBC Scotland on ‘noisy electricity’. The headline is either my fault or to my credit. Aha, thought I – That could be what’s keeping my wife awake some nights – Better take a closer look. So, I did. And guess what? The headline didn’t quite seem to match the rest of the article. It seems it wasn’t a loud noise or a soft noise or a real noise at all, but some spiky-looking things in electricity that you can only see on a computer screen. Anyway, it appeared that some folk in Edinburgh had a big grey box which could get rid of this strange phenomenon and that was that. Being a curious old-time engineer (think triple expansion steam engines! Ed: I’ve tried but I can’t), I began to wonder what might be in this big grey box, which went by the name of a “Faraday Exchange”, so I did a web search on the name. Oh, my!!! What did I uncover but news about a world-beating technology breakthrough led by young engineers in various Scottish universities for controlling the mind-blowing complete interactions of sources and demands on a 21st Century electrical power grid. Today we are all totally dependent on access to affordable and plentiful electricity. We heat our buildings, run our computers, phones, washers etc. on electricity and now we are even turning to electrically powered cars all of which can be plugged in and switched on at any time. The demand is liable to vary hugely at any time. Combine this with the recent emergence of a whole range of sources of electrical energy. We have power stations fired by coal, oil and gas, which can be turned on and off relatively quickly, nuclear, which dare not be turned off quickly, and the whole new family of renewable sources, wind, solar and tidal which come on and off according to the dictates of mother nature. It all adds up to a serious problem to ensure that everyone who needs power gets just the right amount the instant s/he throws the switch and at the same time males sure that the supply from all the sources is adjusted to provide just enough. Enter, stage right, the Exchange…. Lots of these ‘big grey boxes’ can be attached to the power grid at appropriate points and guess what? Since, among other things, there is a computer inside, and the grid is made of wires, they can ‘talk’ to each other and pass on information about local supply, demand and price of available electrical energy. This allows them to select and implement the most efficient and hopefully cheapest supplies to meet the constantly changing demands of consumers. As I said, this is world leading technology and it hails from this little country of ours. For our state broadcaster to headline it solely on the grounds that it ‘cleans’ the power supply seems to me to be a missed opportunity for “Talking Up Scotland”. Hi William – heard the early morning report re. the Faraday Grid on GMS yesterday – It was an interesting piece done by Ken MacDonald (who is the most reasonable – by a long chalk – reporter ‘permitted’ to appear on the GMS programme. The bosses only allow him to cover ‘science’ stories nowadays but he still manages to allow wee bits of ‘hard fact’ into his reports which allow the alert listener to work out that Scotland, and Scottish science in particular, isn’t quite as completely ‘rubbish’ as the head honchos in beeb Scotland would try to have us believe. In Ken’s report he mentioned the Scottish company making the Faraday Grids had expanded from 4 staff to approx. 100 staff in very short order. Clearly Ken MacDonald is told to keep items ‘light and fluffy’ but he delivered this as an unashamedly ‘Talking up Scotland’ item. (Well done Ken MacDonald). Latest figures show increase in renewable electricity and installed capacity. Renewable electricity generation in Scotland increased from 12,194GWh in the first six months of 2017 (which was a record year) to 12,421GWh for the same period in 2018. Installed capacity continues to grow as an increase of 8% seen as more renewable projects come on line. At the end of Q2 2018, there was 10,336 MW of installed renewables electricity capacity in Scotland, an increase of 8% (742 MW) over the year from Q2 2017. Excellent info William, ‘spiky-looking things in electricity’ is about all most of us, including the BBC, understand about electricity, but I’m glad there are a host of engineers that know more!